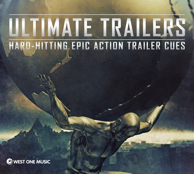 Jeff's music has recently been featured on two trailer music albums. He contributed three tracks to West One Music's "Ultimate Trailers" album, and one piece to Fired Earth Music's "Epic Heart." Both were recorded by the AUKSO Orchestra at Alvernia Studios in Poland, a truly amazing recording facility. The cues were produced by Chris Brown of West One Music, orchestrated by Adam Langston, conducted by Marek Mos and Richard Harvey, and mixed by Krystonite.